Ted Cruz and Carly Fiorina claim they are running mates, but Americans are unaware of what they are running for. 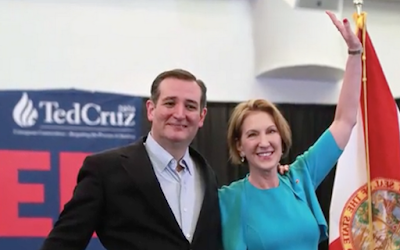 Screenshot of U.S. SenatorTed Cruz (left) and former HP CEO Carly Fiorina (right). WASHINGTON (The Nil Admirari) - Earlier today, U.S. Senator Ted Cruz of Texas and former Hewlett-Packard CEO Carly Fiorina announced they were running mates for something. Americans across the country tried to figure out what the two were running mates for, as it is mathematically impossible for Cruz to win the Republican presidential nomination, which Fiorina quit pursuing in February. "The announcement that Ted Cruz and Carly Fiorina are running mates really surprised me. Now I am more confused than anything, and the rest of the country is right there with me," explained Republican strategist Mark Kinness. Kinness continued, "They are definitely not running mates for the top of the Republican ticket, because they would have to be delusional to think they had a chance of being president and vice president of anything." "Seriously, who would even be irresponsible enough to record, much less broadcast, an announcement coming from Ted Cruz that he had selected a running mate?" asked Kinness. Kinness was asked if there was truly no way for there to be a President Ted Cruz and a Vice President Carly Fiorina in the immediate future of the United States of America and its citizens. "No way. Even with a contested GOP convention where delegates get to vote for president and vice president, there is no way they would select those two pariahs," replied Kinness. "No way." Republican presidential frontrunner Donald Trump kindly reminded the Republican Party there will be violence if the Republican presidential nomination is taken away from him.